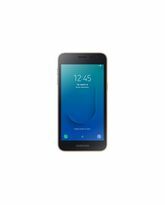 Samsung Galaxy J5 2017 has 2GB RAM for smoother UI experience. 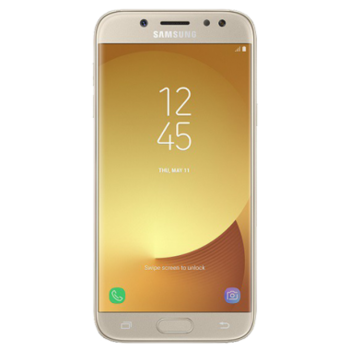 Samsung J5 2017 sports a stylish golden finish.The Samsung Galaxy J5 2017 Dual SIM Smartphone packs leading-edge hardware elements into an elegant design to give you an incredible experience. The 5.2inch, Super AMOLED display of the device renders HD videos at 720 x 1280p resolution and delivers stunning visuals. 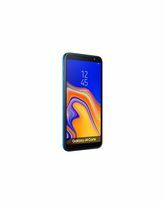 The Samsung J5 draws its performance from a 1.6GHz, Exynos 7870 Octa-Core processor that runs every application to its utmost potential while keeping the battery consumption to a minimum. Experience buttery smooth multitasking and more fluid user interface, thanks to the 2GB RAM module. Carry your digital world with you wherever you go with the large 16GB internal storage. This Samsung smartphone packs a 3000mAh, non-removable Li-Ion battery that provides enough juice to last a day, and then some. The 13MP AF rear camera of the J5 2017 allows you to capture beautiful landscape stills. Click stunning selfies and excellent group portraits with reduced shutter lag with the J5's front camera. The front-mounted fingerprint sensor of the J5 lets you unlock it in a jiffy and secures your sensitive data from privy eyes. Plus, this dual-SIM mobile supports 4G LTE connectivity to always keep you in the loop, with blazing-fast upload and download speeds. Available in a golden finish, the Samsung Galaxy J5 2017 Dual SIM continues the J5 legacy further. The Samsung Galaxy J5 2017 supports a wide range of network bands and ensures that high-speed mobile communication takes place on the go. 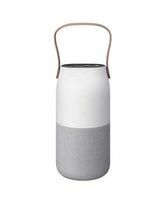 The device supports 4G LTE band and 802.11 a/b/g/n/ac dual-band Wi-Fi connectivity to give you blazing fast Internet access, no matter where life leads you. 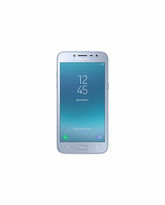 The 4.2, A2DP Bluetooth supports wireless data and voice communication so you can connect this Samsung Galaxy dual SIM mobile to various compatible accessories and enhance your productivity. And when you have 16GB internal and up to 256GB expandable storage at your disposal, low data space is not a thing to worry about. The Galaxy series ensures you get the best Android experience. That’s why this J5 2017 Samsung smartphone runs on Android’s most anticipated operating system, the Android 7.1 Nougat. With innovative and user friendly features of the OS like improved doze mode, split screen view, built in night mode and more, the J5 will take your mobile computing to the next level. And it packs powerful hardware elements to back the OS and give you seamless UI. The 1.6GHz, Exynos 7870 Octa-Core processor, Mali-T830MP2 GPU, and 2GB RAM have been optimized to provide you best-in-class processing prowess and energy efficiency. With a 13MP AF rear camera and its f/1.7 aperture, this Samsung J5 2017 smartphone delivers state-of-the-art image capturing performance. The synchronized LED flash lets you take great shots even in low visibility environment. Record your stunts and dance moves in lifelike 1080p quality and relive them with your friends or start the 13MP front shooter and capture them in your frames too. With features like Touch Focus, face detection, panorama, HDR and more, this 2017 Samsung Galaxy J5 lets you seize the moments your way, in gorgeous details. 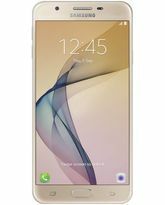 SAMSUNG GALAXY J530F 16GB 4G DS 2017 ARABIC GOLD Samsung Galaxy J5 2017 has 2GB RAM for smoother UI experience. Samsung J5 2017 sports a stylish golden finish.The Samsung Galaxy J5 2017 Dual SIM Smartphone packs leading-edge hardware elements into an elegant design to give you an incredible experience. The 5.2inch, Super AMOLED display of the device renders HD videos at 720 x 1280p resolution and delivers stunning visuals. 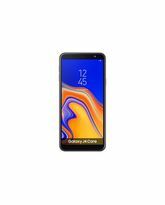 The Samsung J5 draws its performance from a 1.6GHz, Exynos 7870 Octa-Core processor that runs every application to its utmost potential while keeping the battery consumption to a minimum. Experience buttery smooth multitasking and more fluid user interface, thanks to the 2GB RAM module. Carry your digital world with you wherever you go with the large 16GB internal storage. This Samsung smartphone packs a 3000mAh, non-removable Li-Ion battery that provides enough juice to last a day, and then some. The 13MP AF rear camera of the J5 2017 allows you to capture beautiful landscape stills. Click stunning selfies and excellent group portraits with reduced shutter lag with the J5's front camera. The front-mounted fingerprint sensor of the J5 lets you unlock it in a jiffy and secures your sensitive data from privy eyes. Plus, this dual-SIM mobile supports 4G LTE connectivity to always keep you in the loop, with blazing-fast upload and download speeds. Available in a golden finish, the Samsung Galaxy J5 2017 Dual SIM continues the J5 legacy further. AMPLE SPACE. SUPERFAST CONNECTIVITY. The Samsung Galaxy J5 2017 supports a wide range of network bands and ensures that high-speed mobile communication takes place on the go. The device supports 4G LTE band and 802.11 a/b/g/n/ac dual-band Wi-Fi connectivity to give you blazing fast Internet access, no matter where life leads you. 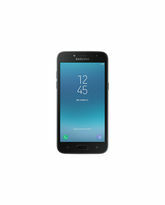 The 4.2, A2DP Bluetooth supports wireless data and voice communication so you can connect this Samsung Galaxy dual SIM mobile to various compatible accessories and enhance your productivity. And when you have 16GB internal and up to 256GB expandable storage at your disposal, low data space is not a thing to worry about. POWERFUL OS MEETS EQUALLY POWERFUL CHIPSET The Galaxy series ensures you get the best Android experience. That’s why this J5 2017 Samsung smartphone runs on Android’s most anticipated operating system, the Android 7.1 Nougat. With innovative and user friendly features of the OS like improved doze mode, split screen view, built in night mode and more, the J5 will take your mobile computing to the next level. And it packs powerful hardware elements to back the OS and give you seamless UI. The 1.6GHz, Exynos 7870 Octa-Core processor, Mali-T830MP2 GPU, and 2GB RAM have been optimized to provide you best-in-class processing prowess and energy efficiency. CAPTURE LIFE! With a 13MP AF rear camera and its f/1.7 aperture, this Samsung J5 2017 smartphone delivers state-of-the-art image capturing performance. The synchronized LED flash lets you take great shots even in low visibility environment. Record your stunts and dance moves in lifelike 1080p quality and relive them with your friends or start the 13MP front shooter and capture them in your frames too. With features like Touch Focus, face detection, panorama, HDR and more, this 2017 Samsung Galaxy J5 lets you seize the moments your way, in gorgeous details.